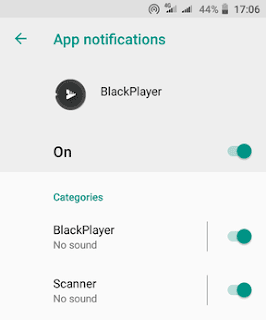 BlackPlayer is a feature rich and customizable android music player. It's been my go to music player for the past 2 years. Within that period, I've been more or less using it on the same Android phone running Android 6.0. I've never encountered any issues with the player until recently when I upgraded to a Redmi GO running Android Oreo (8.1.0). The small issue that surfaced is that the screen wakes up for a few seconds every time the players goes to the next playing track. This is happening on BlackPlayer version 2.53. At first I hadn't realized this since my phone is usually in the pocket when playing music. When I initially saw it wake, my guess was that it was a notification from a different application as it's different from the normal BlackPlayer lock screen that was still accessible when I pressed the lock button. This one on the other hand had just the clock and the playing track details on a black screen with text only controls. I cannot screenshot it since pressing the lock button hides it immediately. Naturally the BlackPlayer settings were the first place I looked to disable this notification. As there was no explicit setting that mentioned this behaviour. I tried first testing different Lock screen options available in the Remote section of the app's settings. This yielded no results prompting me to check the available notifications for BlackPlayer inside Android's App & notification settings. The first handles the lock screen and notification panel notifications. The Scanner is as the name suggests for the music scanner that discovers new music. I tried turning off all the notifications and as it turned out, the waking stopped but so had all the other BlackPlayer notifications. So next I turned on the BlackPlayer category notifications on and left the scanner one off. As expected the notifications came back but strangely the wake notification did not reappear again. On noticing I stopped all testing and assumed the Scanner notification was to blame. I say assumed since days later as I write this that assumption got invalidated after I tried replicating the issue before posting this article. Turns out it's not the Scanner notification that is to blame but the BlackPlayer one. What happens is that toggling the BlackPlayer category notification off stops the waking notification but doesn't reactivate it when toggled again. Quite strange I might say. At this point I don't know what exactly is at fault here: the player, the Android OS or my Redmi GO.